I’m curious of how many out there knows that Alien are back and running again – outside the hard rock / AOR community, that is. I’m even more curious of if there is anybody outside of Sweden who knows that there ever was a band called Alien in the first place. In Sweden we do, well at least if you were growing up in the 80’s. 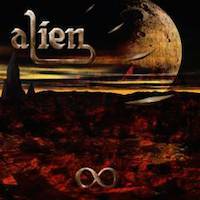 Back in 1988, Alien (Jim Jidhed – vocals, Tony Borg – guitar, Ken Sandin – Bass, Toby Tarrach – drums, Jimmy Wandroph – keyboards, yes, all names are very Swedish sounding…) released a cover of the old The Marbles song “Only One Woman” and got themselves an avalanche of a hit with it. That also led to that their self titled debut album sold shitloads of quantities and they had a couple of hits more in the backwater from that. They had signed with Virgin records and were about to get a world-wide launching of said album when singer Jim Jidhed decided to leave. They quickly installed new guy and brilliant singer Pete Sandberg, re-recorded the album and cut a new single for the re-recorded album, again a cover, this time “The Air That I Breathe” by The Hollies – and the whole thing just fell apart after that. When the second Alien album was released, only Sandberg and Borg remained from the old line up and the album, Shiftin’ Gear (1990) was presented as a duo. The album didn’t do much and Alien kept on existing with different line ups for a few years where only Borg remained as a an original member, releasing the odd record to very little interest before Borg decided to lay the band to rest. Jidhed and Borg tried to reunite with a different rhythm section and keyboard player in 2005 with Dark Eyes, a decent AOR record, but that one too fell flat to the ground. But back in 2010 the original had some offers to play festivals here and there and the band decided to give it a go again, to mixed reactions. Me, I saw them play to 20 people at Getaway Festival in Sweden a few years back and it was a pain to watch. They sounded stale, looked really, really old and the whole thing, in my opinion was a complete fiasco. That’s why it was a big time surprise when I found out that they were about to release a new record. How could this possibly turn out to be anything other than a huge failure? Did these guys really have it in them to release anything worth-while in 2014? Even though Alien’s music back in 1988 were right up my alley, I never became a fan. I always thought that “Only One Woman” was a throwaway – yes, I know it was a huge hit – and even though the rest of the songs weren’t a bad per se, nothing stuck with me what so ever. In my book, Shiftin’ Gear was their finest moment, a bit more bluesy and 70’s oriented and I always prefered Sandberg to Jidhed – Sandberg having a similar kind of voice, but raspier. So at the end of the day, listening to this new original line-up reunited Alien was done with some major scepticism on my part. So imagine my surprise when opener “In Love We Trust”, a rocker in the AOR vein, turned out to be real damn good. Second song “Unbroken” showed that the opener wasn’t a one-off. It’s a really good melodic rock song with a striking and catchy melody. There is some major hit potential in “Love Will Lead Me Home”, a great pop-rocker and the same goes for the brilliant power ballad “I Believe”. The song has a gospel kind of twist that makes it differ a bit to the ordinary power ballad. Do you remember / know of / have you heard the band Giuffria? Ok, did you like them? Well if so, then you’ll love “Summer Of Love”, a brilliant pop song that would have fitted like a glove on Giuffria’s 1986 album Silk And Steel. There is more hit potential in “What Goes Up” and an awesome uptempo AOR rocker, “Wildheart” is superb with its big Journey influence. However, the finishing ballad “In Truth” turns out to be a dull one, a shame to end such a good album on such a sour note. Well, you can always finish early when listening to the album. I’m not really sure how, but this bunch of merry old men has managed to produce a really, really good AOR album, an album that I didn’t think they had in them. It’s very well produced and has a clean, smooth sound, just like an AOR album should have and most of the songs are awesome even though the album wears off a bit in the end. Also, age has only improved Jim Jidhed’s voice. Sure, he has to work harder to hit those high notes, but the voice sounds so much better, more raspy and not so clean as it used to. As a fact, I’m thinking of Paul Shortino (Rough Cutt, Quiet Riot, King Kobra) from time to time, they both share the same well sounding raucousness, if that is actually a real word… Of course, guitar player Tony Borg still sounds like an AOR-ish Ritchie Blackmore – hey, the guy even look the part and he did name his son Ritchie – but as Alien’s music is pretty far removed from anything Deep Purple or Rainbow (even the softest version of Rainbow are harder than Alien…), Borg’s Blackmore-influences is a nice twist to the AOR of Alien’s music. A really good album and when 2014 is summed up, this will most definitely hold the number one spot as the biggest surprise of the year.